Fábio Moon and Gabriel Bá's blog: 5, the rhino, and a bunch of our comics online. When we started talking about 5, one of the early ideas was that of drawing animals with our characters. 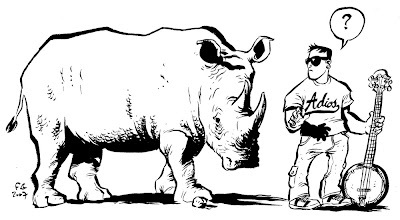 We never ended up using the rhino, but I just wanted to draw it anyway because it's cool as hell to draw. Khepri.com is doing a great job at making sure you can get our book anywhere you are. From September 16th to September 22nd, not only 5 was the best selling item, but Casanova 2 was number three and Casanova 6 was number five. De:TALES was there too, on the best seller graphic novels, at number four. If you look at it, I think it might be the first time during this entire year that there isn't a Brian Wood book or comic on the top five best selling items at Khepri. A clear sign of the apocalypse, or a good start for the rest of us, comic book creators? Becky seems to be well represented as well, with Nebuli, MINIS and American Virgin popping up on the list. This was a good week for the 5 crew. I just today received 5 and MINIS in the mail from Becky. 5 is seriously one of the best comics I've looked at all year, especially Becky's story by Bá. It's such strong strong comics and the LOVE of it just vibrates off the pages. You're Fabio, Rhinos are awesome. I'm going to go get one and teach it to play guitar. Fantastic concept, a friend and I also drew some ideas of us as animals, it is very funny.